For the second installment of the new, Biting Mr. Bittman series, I figured I should stop fooling around, take a big risk, and attack a recipe that relies heavily on salt. You know, just in case Mr. Bittman is actually reading this blog–good morning, Mark!–and wants some proof that this Sodium Girl really knows how to cook everything, without salt. So I scoured his recent recipes for a true challenge–searching for a dish that usually comes in a take-out box and that uses a lot of soy sauce–basically, something of Asian origin. And after sifting through asparagus pesto and laid-back risottos, low and behold, the angels did sing: make Mark Bittman’s Yakisoba! So I did just that. With that introduction, I took Mr. Bittman’s recipe–and its sense of “leeway”–and made adjustments to turn his yakisoba into my yaki-low-sodium treat. that it’s the sauce that makes the dish. The dressing is a mixture of salty products (like ketchup, soy sauce, Worcestershire, mirin, and, oh my kidneys, Tabasco) which lend a silky texture and sweet, savory, spicy, and yes, salty flavor to the noodles. But even with these condiments at play, I knew exactly how to replicate the texture and the taste of Bittman’s thick sauce without compromising my health needs. For the ketchup and mirin, the good news is, these products already exist in no-salt added versions. But if you cannot find the low sodium mirin–I’ve only found the Shirakiku brand in obscure Asian markets–then you can always mix ½ cup sake with a 1/6 cup of sugar. So those substitutes are easy. Then swap out Worcestershire for a (slow) splash of molasses. And to mimic the heat provided by the Tabasco, simply use a few shakes of chili oil. With that, you have a sweet, spicy, savory, no-salt sauce that will stick to every noodle and bring flavor to every bite. Like Mark says, Yakisoba is “good cheap fast food.” And now it can be low sodium, too. Chow on. 1. In a medium-sized pot, bring water to boil and cook your udon noodles. This should take about 10 minutes. Once they are softened (but not mushy), drain the water and let the noodles cool. Sprinkle them with some sesame oil to keep them from sticking together. 2. In a wok or a large frying pan, heat the grapeseed or sesame oil until it is hot. Add the garlic, ginger, and mushrooms until they have taken on a golden-brown color. Add the pork. Cook until the pork has turned from pink to white, about 10 minutes. 3. 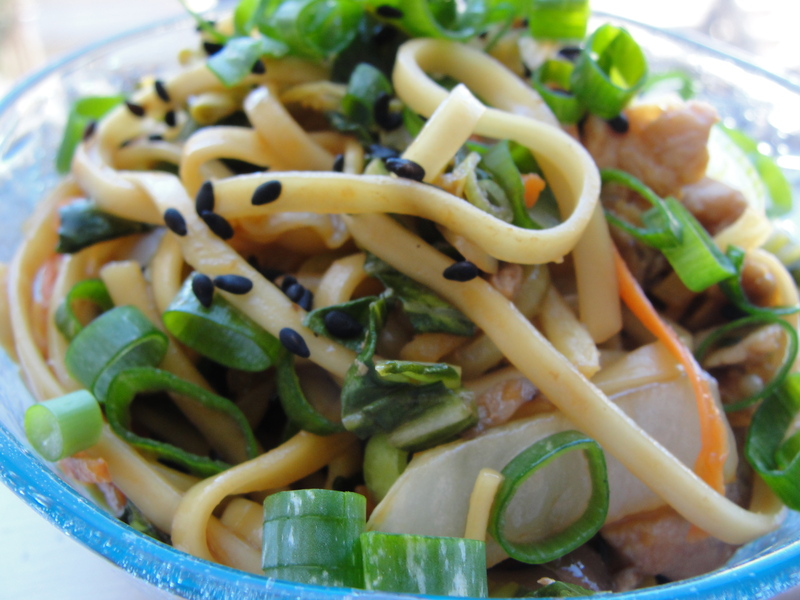 While the pork is cooking, mix up your yakisoba sauce, and make sure all the other vegetables have been chopped and diced. 4. Add the carrots, cabbage, and half of the scallions to the pan, and let cook on medium-high heat for another 5 minutes. If the ingredients start sticking to the pan, feel free to throw in a few teaspoons of water or a little more sesame oil. 5. Add the udon noodles to the pan and the low sodium yakisoba sauce, and cook for another 2-5 minutes. 6. Spoon heaping portions into big beautiful bowls. Sprinkle scallions on the top and serve to a grateful audience. Enjoy. I’ve never tried yakisoba, so I think I will make it your way first – that way I won’t crave the saltiness of the traditional way. 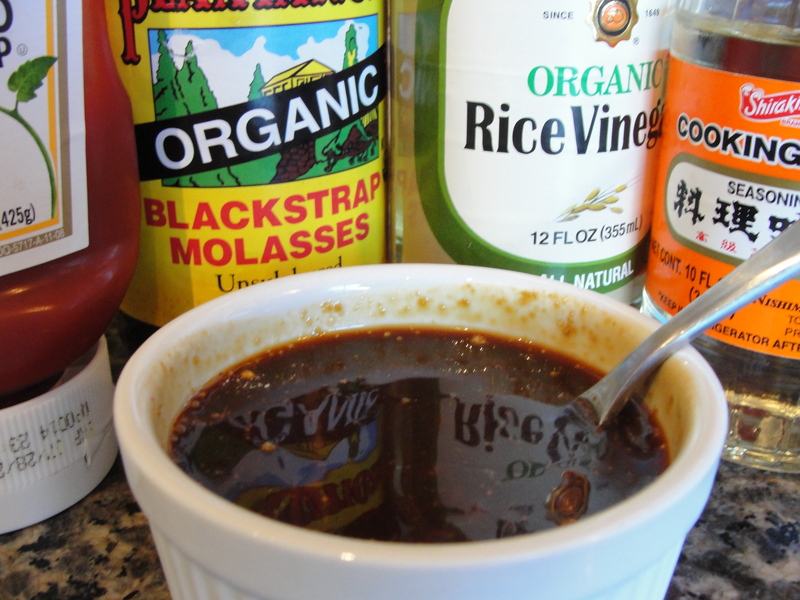 Thank you for the recipe for Homemade Soy Sauce! I have been searching for one for quite some time! Perfect!!! Will have to cook this for my son who is on dialysis. He can’t have tomato though so I will use your recipe for the red pepper ketchup instead of the ketchup. Can’t wait to try this! Wonderful and all my best (and many healthy thoughts) to you and your son! Let me know if you have any questions or requests!